You put a lot of thought into your wedding - the groom, the dress, the flowers, the food, the church and the guests. It just makes sense that you should also place a great deal of importance on choosing the person who will photograph all of that for you. After all, once the wedding is over, the photographs will be all that you have to help you remember the day for decades to come. 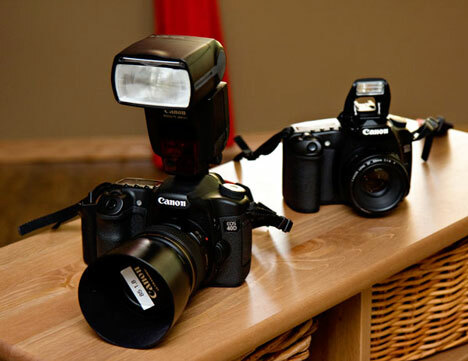 Left, a professional Canon 40D DSLR with 580EXII flash attached. Right, the EVIL pop-up flash that a pro will never use. Most markets are flooded with photographers - or rather, with photographers and wanna-be photographers. I like to call them pros and fauxs. But how can you tell the difference? Appearances can be everything. You can tell a lot about someone's degree of professionalism by the marketing materials. In this case, a pro will have an attractive, easy to navigate website, a professional logo and professional marketing materials. All of these should be polished and contain no errors in spelling or grammar. Ask yourself: "if they can not pay attention to the details of their own image, why would they bother with yours"? Portfolio. A pro will have an extensive portfolio that shows a wide range of couples, locations and seasons. Ask to see an entire wedding so you get a feel for what to expect from your wedding photos. You should feel comfortable that every photo you will receive will be awesome, and that you won't end up with a bunch of mediocre photos and only a couple of "wow!" shots. The camera should be a DSLR - that is, a digital single lens reflex camera. This means it has interchangeable lenses, so the photographer can swap between them to use the best one for each situation. Nikon or Canon. With few exceptions, most photographers choose either Nikon or Canon cameras. A pro will have back ups for everything. That means at least two cameras, two flashes, multiple lenses, tons of memory cards and batteries. A pro will NEVER use the pop-up flash on the camera. A pro will NEVER point a flash directly at you indoors. Professionals will either choose to bounce the flash above or behind them by swiveling their flash, use a diffuser (opaque plastic piece that fits over the lens) or use a bracket that will raise the flash above the camera (looks a little like a medieval torture device). A pro will be able to handle any lighting situation. With a combination of on camera, off-camera and possibly large studio lights, a pro will be able to light anything from a dark church to a theatre to a large reception hall. A pro will be able to handle any situation that comes up - a sudden change of weather, battling in-laws or wardrobe malfunctions, a pro will be able to handle it all without blinking. Contracts. A pro will have a professional, legally binding contract and you will have to sign it in order to book your pro. A pro will ask the right questions and help guide your day. A pro will inquire about any family situations (divorces, widows etc. ), the timeline for the day, any locations you had in mind for photos and other questions that will effect their job for the day. A pro will also be able to answer any questions you may have. A pro will have good word of mouth. Ask around about your pro and listen to what people say. 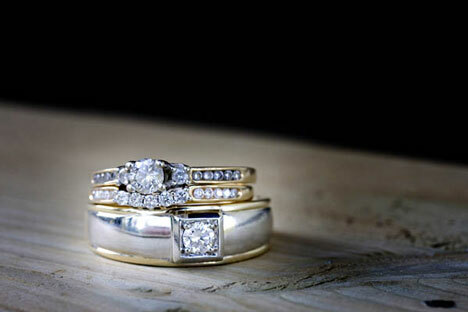 Ask your DJ, wedding planner, caterer, florist and dress shop for recommendations. A pro will use a professional photo lab, not the local drugstore or Wal-Mart. As such, they'll be able to offer odd sizes and way-cool products like canvas gallery wraps, metallic prints and other products the general public does not have access to. A pro will offer professional albums from companies like GraphiStudio, Finao, Asuka and more. These albums will be priced high because they're worth it! A pro will back up your photos to multiple sources - DVD and an external hard drive etc. - so that they'll be around for years to come!